by Dave from The Longest Way Home ~ July 21st, 2011. Updated on May 28th, 2014. Published in: Travel blog » Thailand. Granted I was having a bad day up until now. 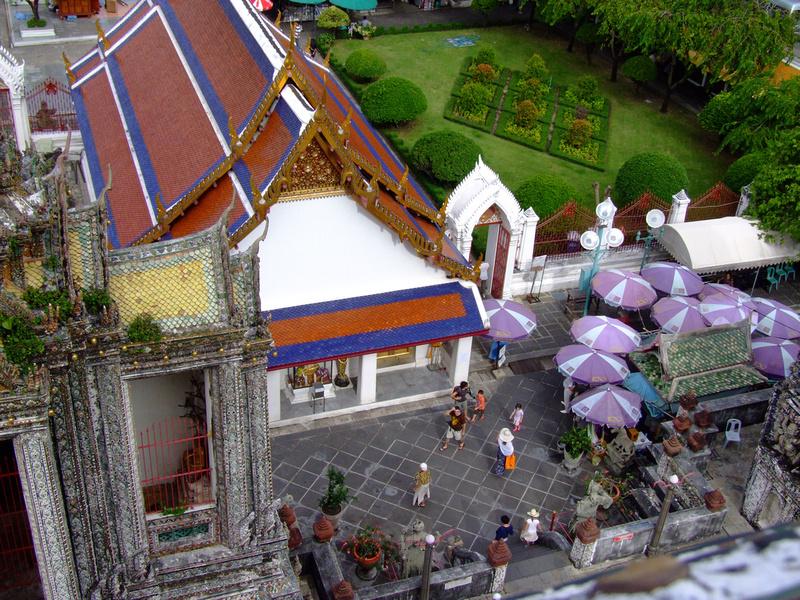 But things got better when I learned that the entry to Wat Arun was only about $1.50. Better yet, there was no one collecting tickets, so no charge. Late afternoon also meant that the heaving tours had already left. I didn’t know where to, nor did I care. Wat Arun was virtually deserted. The only people around seemed to be a couple of locals. It doesn’t get any better than that for visiting a temple. Nicknamed “temple of the dawn” due to the early morning light reflecting off the wat’s seashells and porcelain decoration I wondered if this is why it was so empty in the afternoon. Built in 1809 the temple is made up of 5 pillars. Four smaller pillars squarely surrounding a 66 meter center pillar. All of which you can climb. 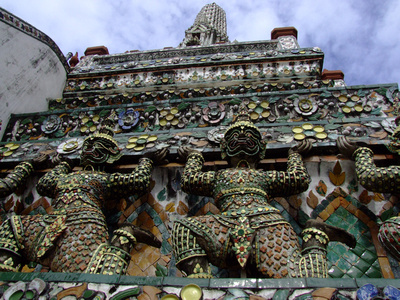 Apparently the porcelain that decorates Wat Arun came from old Chinese boats from the era of high trade between the two countries. Wat Arun’s full name is Wat Arunratchawararam Ratchaworamahawihan. Put a group of tourists together and send them into a site, and they’ll come out just as they went in. Go in alone, and there’s a good chance you’ll come out with something new. In my case I met a Thai photographer precariously perched on one of the Wats pillars. I joked if it was really worth the effort to take a photo like that. 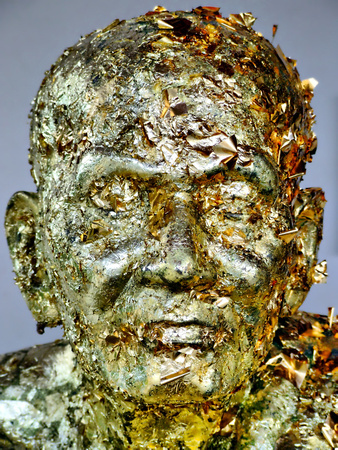 Gold leaf monk head at Wat Arun: have I finally found a piece of peace in Bangkok? Turns out his wife studies masonry and he’d spotted something interesting. He showed me the photo. A small decorative piece. Then he laughed and said that if he was not married he wouldn’t have gone to the trouble. Right then and there was an old age virtue of two men from different cultures agreeing about the pain endured in trying to please a woman without her even knowing about it. We laughed at this and climbed around the wat some more. Neither of us really caring what we photographed, so long as it looked good to us. I actually like talking with Thai people. So long as they are not apart of a service industry. Which is also true of just about any nationality. So far, the reality is the only thing I don’t really like about Bangkok are the tourists here. It seems this prosperous industry has led Bangkok into a city of different worlds. I see multi-culture here, but I see it more as a necessary evil rather than for the sake of culture. And, I don’t get the feeling that I do in say Kuala Lumpur where there are serious race issues beneath the surface of multiculture (read more about multicultural problems in West Malaysia). I do however think, that without money, Bangkok would not nearly be as nice a place to stay. I wonder too about the rest of Thailand when it comes to tourism. Is it the same mentality. The same mad rush of tourists. And, are all these tourists quite happy taking tours and mini vans rather than make their own way. Maybe I am just old school. Or maybe I have seen and experienced all this already, so nothing really is new to me here. I’ve been to enough countries and places to know not to judge a place by first impressions. But, I’m also experienced enough to know my gut feeling. Bangkok is not home. But, it can be a useful stepping stone. So I leave Bangkok knowing that I will be back. Only next time it will be on my terms. This is what happens when one door on this search closes and another opens. Planning on booking a hotel room in Bangkok? I recommend you try my own hotel search for Bangkok. (previous post) « What happens when you get food poisoning in Asia? Great photos as always. It looks so peaceful there. I think that you have done the right thing in Bangkok and learned well neither to hate nor love the city. I have only heard people say one or the other. Cheers, it’s very quiet there in the afternoon alright. Maybe I just got lucky! As above, I neither like, nor dislike Bangkok. A case of take it or leave it, but not live in it! I do love Wat Arun. I know it’s a heavily touristed site, but each time I’ve been I’ve seen something new. I love how you can’t tell it’s covered in pieces of china until you are up close to it. My understanding is that the broken pottery was used as ship’s ballast on trading ships returning from China, but who knows. Glad you haven’t closed the door on Bangkok, but you’ve said the food is not your favorite and I know how that can color one’s impression of a place (I feel the same about Central Europe). No goulash for you then! No, Bangkok is not for me. If I return, I’ll just be passing through. A case of been there, seen that in many other places, many other times. Onwards I go! Nice write up. Where’s next? Are heading to Cambodia? If so, send me a quick email, I will give you details of an amazing contact. Thanks Nathan, not hitting Cambodia yet. Got some time out things to do first! How easy is it to get to that Wat Arun? Thanks Stuart. 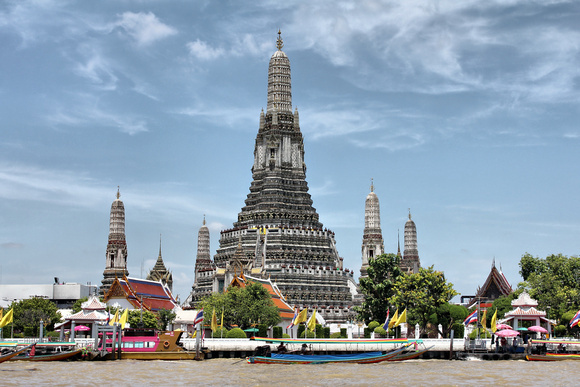 It’s very easy to get to Wat Arun. There are countless boats going up and down the river all day. I’ll have a feature on it at a later stage. Wat Aran was one of my favorites places in Thailand. I love the intricate design, which your awesome photos do well in depicting. 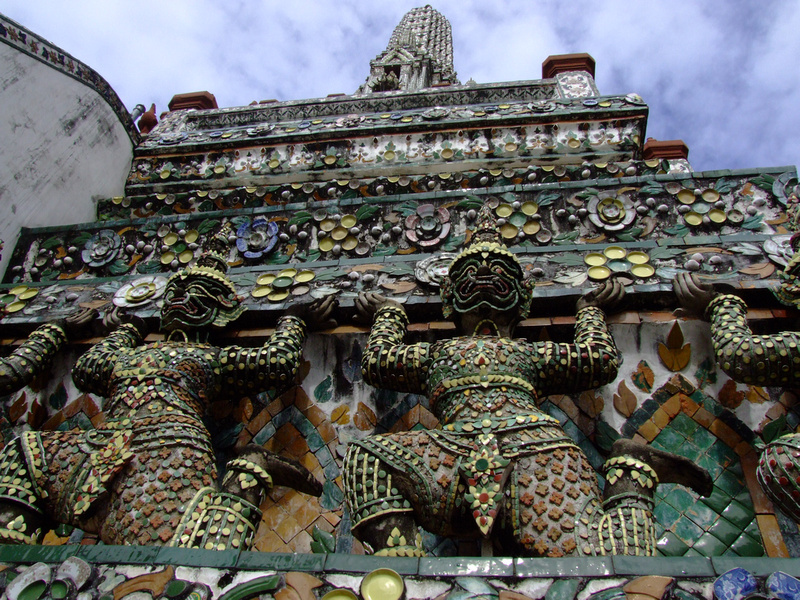 Glad to hear you also liked Wat Arun Ted! Thanks for the kind words too. It’s certainly quite different from the other places. I just posted a photograph of the week featuring Wat Aran, and I linked this post. I was planning to have a trip to Bangkok for a vacation and your post about Bangkok help me to get some details. This will be my 2nd trip outside the country, maybe I will enjoy it or maybe not. You are right about what you’ve said, that without money, Bangkok would not nearly be as nice a place to stay. Not only in Bangkok I guess. Looks like a really interesting design, nice history too. I’ve only heard friends talk about boozing it up in Thailand. A few temples, and the food. Good to see your perspective. The Gold Monk looks so interesting! Is it inside the temple or outside? It’s just outside the temple in a small stone archway. A little hard to miss, but it’s near the entrance/exit areas. I love the “Gold leaf monk head” sculpture :) Sounds like you are “bleh” on Bangkok. I’d love to hear your take after you spend more time traveling around Thailand. Personally, I loved the comfort of Bangkok’s 7-Elevens, its plentiful $1 street foods and its A/C malls that sell $3 t-shirts (with no haggling). A relief after traveling through some rural areas in SE Asia, like parts of Laos.